Devil Survivor 2:The Animation is an anime based on the 2011 DS game Shin Megami Tensei: Devil Survivor 2. A few months back, I called it one of the anime you'd be okay skipping last season because of its first half being rather cliché and boring. And while its second half wasn’t amazing enough to make the whole series a must see, it was certainly good enough to make watching it not feel like a waste of time. Let's get the bad out of the way first. The first half of Devil Survivor 2 is the very epitome of your standard monster catching/battling anime. Each episode the characters come across a new monster and must overcome it by getting a new monster or new ability of their own—or by simply relying on the power of teamwork. The conflict that drives the plot is hardly compelling—defeat the monsters or everyone dies—and thus the character motivations seem equally one dimensional. And then at the halfway point, we learn what exactly happens if the humans win and the whole story takes a major turn for the better. Of course, from the moment you hear the twist, you will be able to predict the ending—there is really only one way the story can go and it's something you have no doubt seen before. However, inside this predictable framework, there is an excellent amount of drama to be had between the characters. Suddenly, there aren't two sides to the conflict, but four. It's no longer a war of simple survival, but one of conflicting ideas on how exactly the world should work. The characters in Devil Survivor 2 are, for the most part, woefully underdeveloped, though that is not to say they receive no development at all. Rather the characters are given rudimentary backstories—just enough to explain their goals, motivations, and why you should start caring about them. This is even true of the three main characters—especially Hibiki, the hero protagonist. All we learn about him is that he is smart, talented, and cares for his friends. The main villain of the story—or possibly the anti-hero, depending on your point of view—on the other hand, gets a ton of development. Much more of the series' run time is spent on his backstory and goals—and by proxy those of his entire organization—than all the other characters combined. This makes him an excellent villain. You understand not only what he's doing, but also why he's doing it—and even why he needs to be stopped. Over the show's thirteen episodes, you will encounter a lot of characters. And as all of them have nearly the exact same level of character development outside of the villain, an interesting side effect arises: it is nearly impossible to figure who exactly is a one-off character and who is a main character. Generally in anime, we feel that the main characters are safe from death—at least until the show's climax. 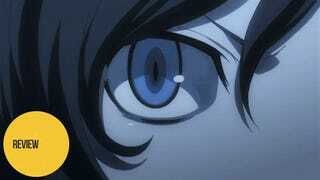 But in Devil Survivor 2 all the characters could possibly be main characters. So when they start dropping like flies, it is genuinely shocking. Thus the entire show permeates with a feeling that no one is safe—that any conflict could possibly see your favorite character killed. It really makes the whole series feel more tense than it has any right to be. Many stories have the hero and villain forced into a situation where they have to work together. But few are so convincingly done as in Devil Survivor 2. Simply put, if the two do not work together existence itself will be erased. Moreover, as any backstabbing will likely end in their total failure, there is none. The villain states his goal very plainly and challenges anyone who makes it to the end to take him on. And also unlike many such stories, the hero and villain are far from being on equal footing in a fight—especially to start. The villain seems capable of defeating all but the strongest monsters singlehandedly, and so his looming threat only grows as the series progresses. This divide only seems to widen as the characters who oppose the villain drop one by one. It gives every victory over the monsters a bittersweet taste as it always feels like the real battle is just ahead and our heroes are getting less prepared, not more. When it comes down to it, Devil Survivor 2 has the misfortune of a run-of-the-mill first half followed by an above average second half. And while I hesitate to recommend any anime that takes half its running time to “get good,” monster training anime fans—not to mention Shin Megami Tensei fans—will likely find the series more than a little enjoyable despite the slow start. As for anyone else, I stand by my earlier statement: It's safe to skip this one. However, if you have some time to kill, you could easily do much worse. Devil Survivor 2 aired on the Tokyo Broadcasting Station in Japan and can be watched for free with English subtitles on Crunchyroll and Hulu.